Thank you for your generous help. As we told you last month, we are just squeaking by, but just squeaking we are. You and your intentions are remembered at our weekly staff meeting, and in our personal prayers, too. Thank you a million times over. God be with you and greatly bless you! WISE SOPHOMORE: (left) You would be very proud of Kellen Baker, a Nome youth who asked to volunteer host a radio program over the summer. This year, Kellen is a sophomore at the University of Alaska Fairbanks, majoring in education. He’s one of three young people from Nome who do summer volunteer work for the mission. Kellen’s work has two benefits. First, it will give him the opportunity to learn if broadcasting might be a career he might want to pursue. And, our listeners enjoy hearing what good things young people from this region can accomplish. 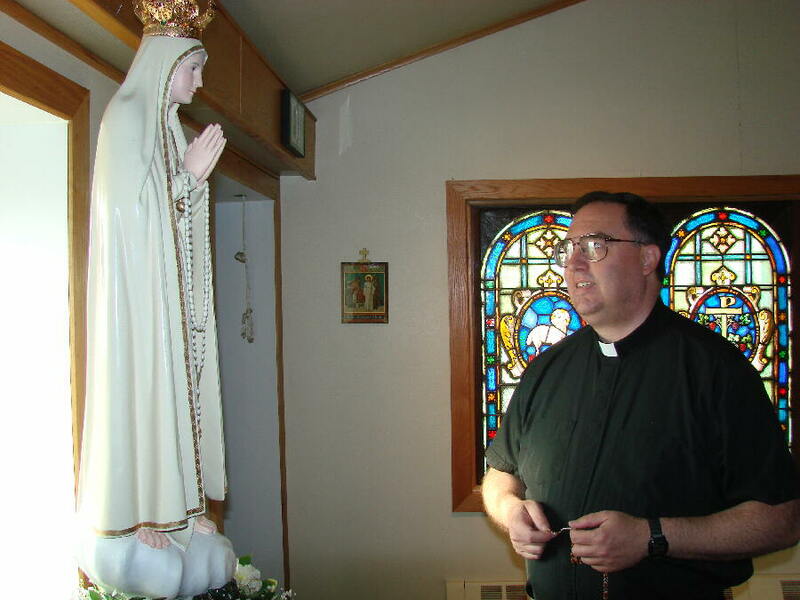 LONG JOURNEY: Former KNOM volunteer, now Nome pastor Fr. Ross Tozzi (in an image from last September's Nome Static), wove into a Sunday Mass radio sermon his trials while trying to return from isolated Little Diomede Island, in the Bering Strait. He was there for a Saturday wedding, hoping to leave for the mainland in a small boat in a day or two. But the seas turned rough. Eight days later, a passing Canadian Coast Guard cutter ferried him to the tiny village of Wales, where the next plane was shy one seat. The pastor of Wales’ small Lutheran church put him up for the night. KNOM is the oldest Catholic radio station in the United States, beaming education, news, encouragement, companionship and inspiration 24 hours a day throughout 100,000 square miles of extremely remote western Alaska, thanks to you. INSPIRATIONAL SPOT: We don’t grow by chasing ourselves in small circles of regret for our human weaknesses. We don’t grow by turning the spotlight of our attention on the failures of others, either. We grow by focusing our minds and hearts on Christ, and dedicating ourselves to His service. 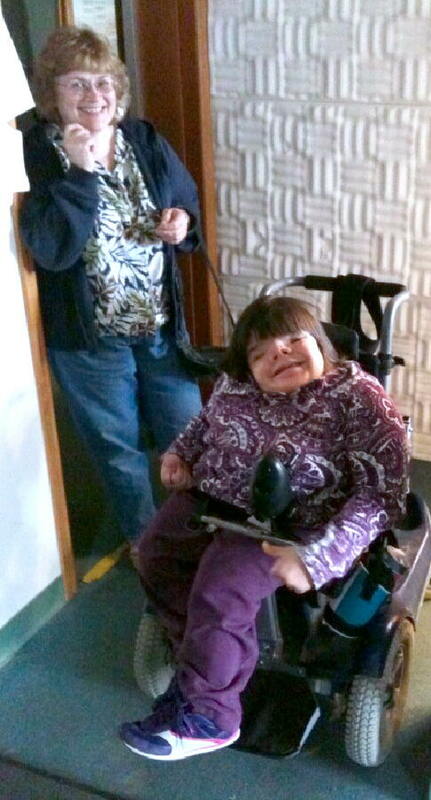 ALL SMILES: (left) From her wheelchair, Tuesona Tungwenuk (too-SAH-nah TUNG-gweh-nuk) chats at the entrance to Studio A, while mom Nanci looks on. Although she suffers from severe birth defects, Tuesona gets around, and graduated from high school in May. A few years ago, she asked if she could volunteer for KNOM. At first, it was weekly hour-long sessions, mostly writing spots with program director Kelly Brabec, and then voicing them. And so, once a week, she co-hosts a live radio program, with volunteer Leah Radde. Each hour-long show features a person, usually a musician, who lives with a disability, focusing on what they have been able to accomplish and how they have worked around their limitations. 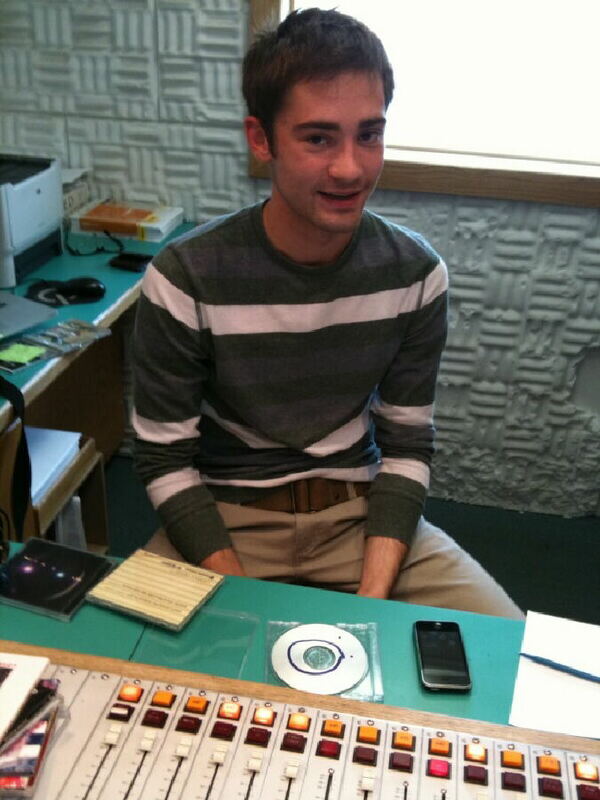 It’s a highlight for the KNOM staff and for our listeners, too. Thank you for helping make a special bright spot in Tuesona’s, and our, week! LAST MONTH, we were out of space. But we have to pass this on to you. How many radio stations get greeting cards on the anniversary of their signing on? We think you will join us in warm appreciation for these, and the many other messages of goodwill we received, for work we have accomplished, thanks to you. 600-POUND VISITORS! 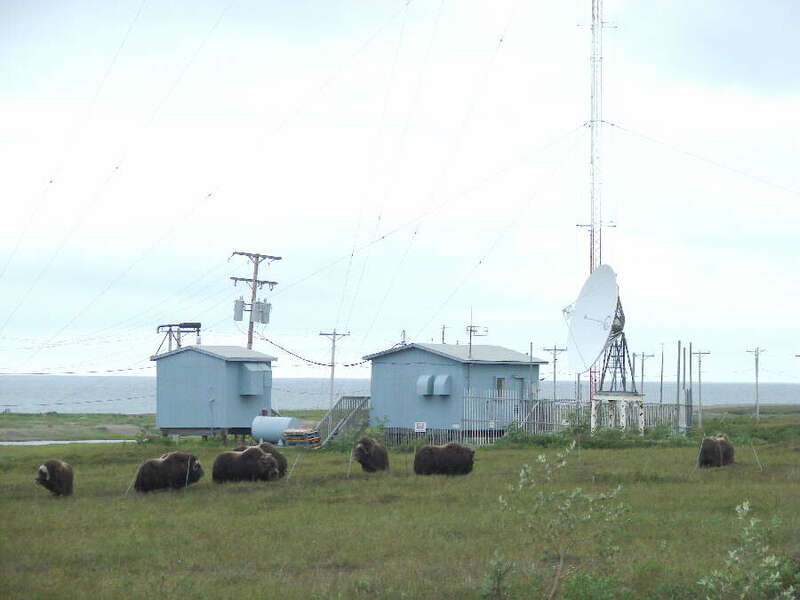 A listener called to alert us that a herd of muskoxen was at our AM transmitter site three miles out of Nome. It turns out that the nine huge beasts were just looking for a late lunch of tundra plants, followed by a nap by the Nome River. Muskoxen are native to many northern climes. In Alaska, they were hunted to extinction more than a hundred years ago. In 1930, 34 of the animals were imported to Fairbanks from Eastern Greenland, and later sent to remote Nunivak Island to populate in the wild. 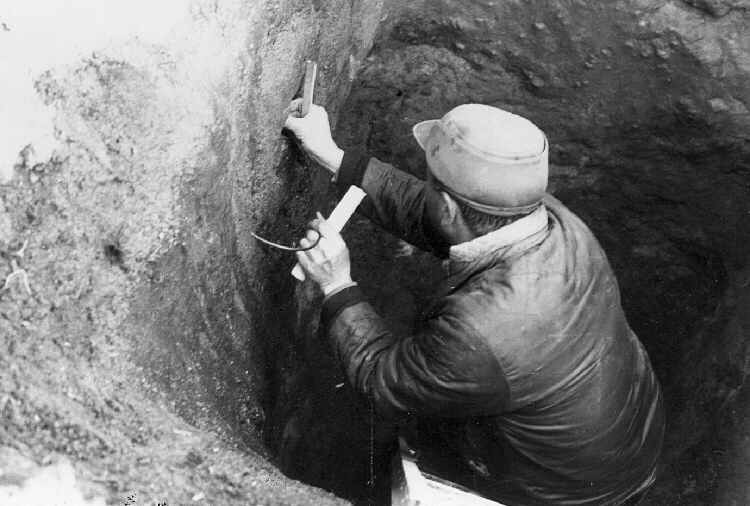 Later, they were introduced to the Nome area, where they thrive, with a population of about 1,800 today. 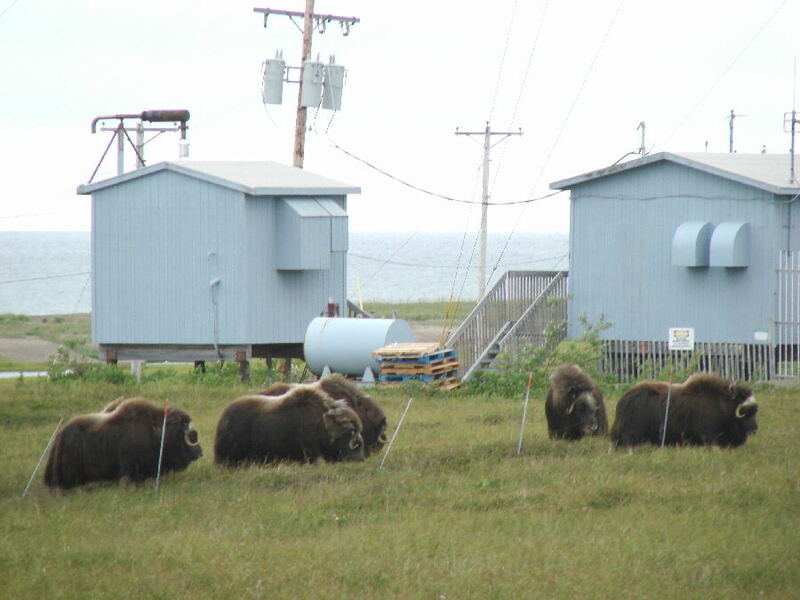 In summer 2010, this small herd approached closer to the city of Nome than ever before. While they are fairly tolerant of humans, they dislike dogs, and several loose pets have been seriously injured this year. 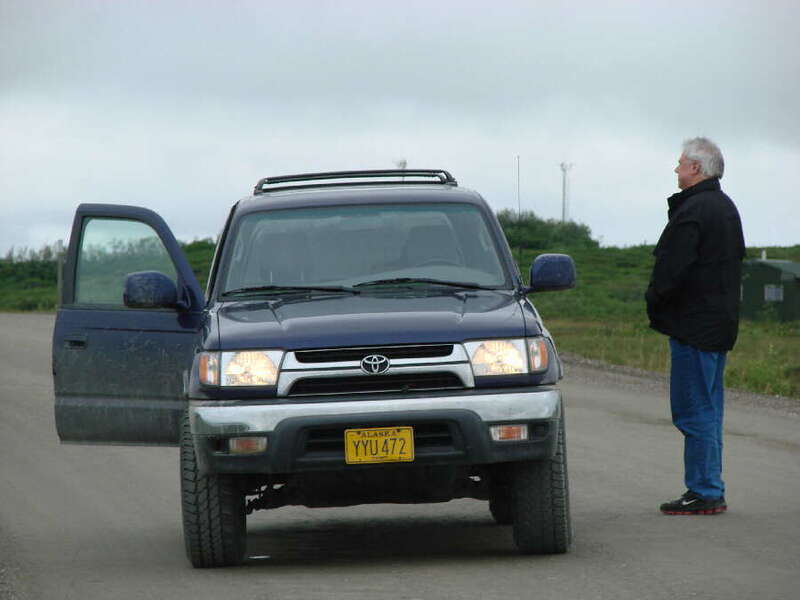 (Left) From the gravel Nome-Council road, KNOM general manager Ric Schmidt observes the animals from a safe distance. Please consider adding the KNOM radio mission to your will. Thank you! 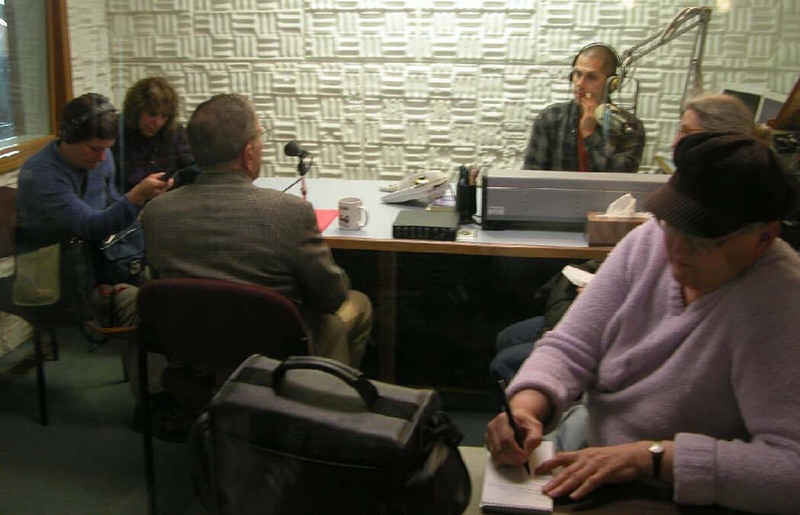 REST IN PEACE: (left) We especially mourned the death of Alaska Senator Ted Stevens, shown here in KNOM Studio C in August 2005, holding a press conference with KNOM and the Nome Nugget newspaper. (Below, left) In this reverse view taken from Studio B, you can see Paul Korchin at the controls of this live broadcast. In the foreground is Nome Nugget publisher Nancy McGuire. At the time, Senator Ted was third in line for the presidency, and was protected by the Secret Service. Several agents watched the front door, but oddly, nobody checked the back door, which is closer to Studio C, and was wide open at the time! 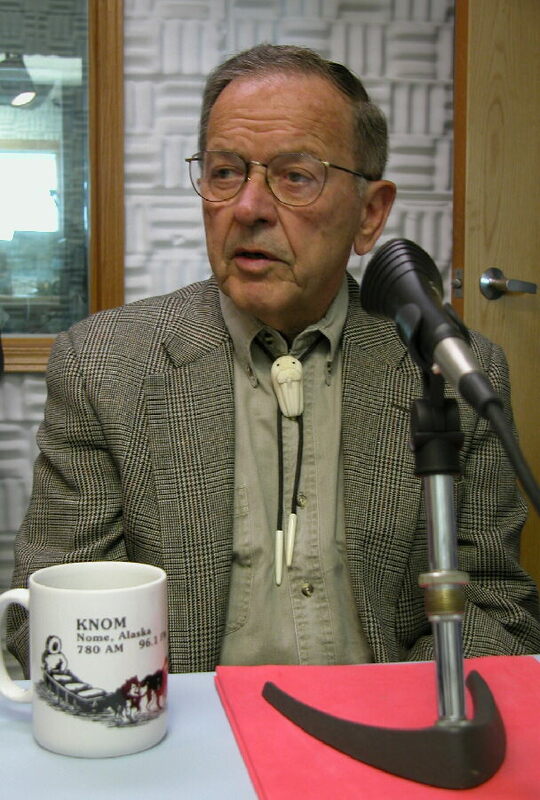 Not only was Senator Ted a relatively frequent visitor to KNOM, perhaps once a year, he was integral in the station being established and a great friend of our work. Over 40 years ago, the application for a new Catholic Nome station was blocked in Washington, DC by two obstacles. First, the Federal Communications Commission had imposed a freeze on establishing new AM stations. It was Senator Ted who over time relentlessly chipped away at government agencies and overcame both hurdles. Fifteen years later, he championed FCC action that provided KNOM listeners extensive distant signal protection. Senator Ted, may you rest with the Lord. We could not have asked for a more caring advocate and friend. MATTHEW 25:36: “I was…in prison and you came to me,” Jesus is quoted as saying. Not long ago, Tara Schmidt, daughter of general manager Ric and business manager Lynette Schmidt, was working a summer job at Nome’s youth detention facility. Tara, now a junior at Gonzaga University in Spokane, Washington, discovered that one of the young inmates always prayed along with KNOM’s daily rosary program. But he did not own a rosary. Tara quickly corrected that. Yay, Tara! “BEARLY” NEWS: A grizzly wandering into your campsite is never good. Recently, a listener recounted a bear story similar to ones we’ve heard a few times before. To shoo away the bear last month, the man turned his battery radio, tuned to KNOM, to full volume and the animal bounded away. WE’RE UP TO 25,500 inspirational spots broadcast so far this year, and an equal number of educational ones, and of course, you share in that accomplishment. Thank you! INSPIRATIONAL SPOT: The amount of light we get doesn’t depend so much on the voltage in the lines. Usually it’s the size of the bulb that makes the difference. God has given us unlimited power through His Son. But we cannot give His Light to the world through small bulbs. Without charity, without adequate time for worship and prayer, without dedicated service, we have no right to expect great results. We are the light of the world. Do we expect God to give us the Light to illuminate the earth, but we’ve only plugged a 15-watt bulb into His power line? INSPIRATIONAL SPOT: Lord God, Our Creator, help me to create, too. Create peace by my forgiveness. Create understanding by my being open-minded. Create hope by my gentle caring, and create love by generously serving others. FORTY YEARS AGO: September 10, 1970, pro bono Washington, DC attorney Joe Hennessey gives the green light to develop the transmitter site. 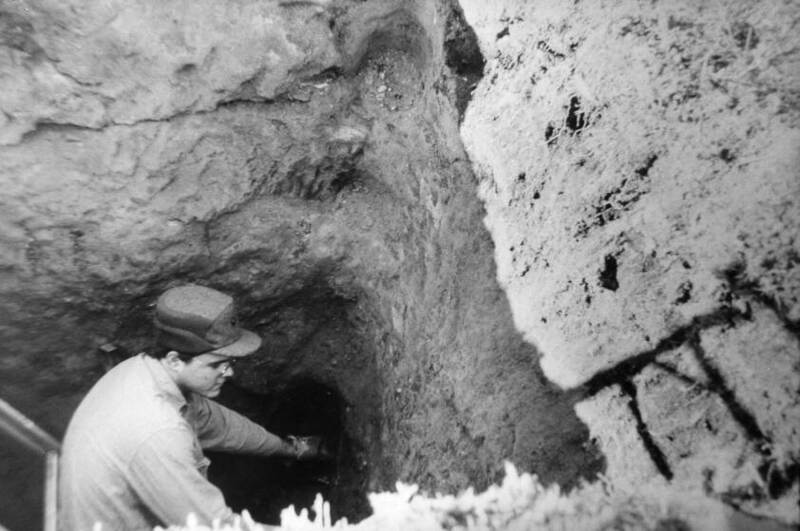 After a week, it’s clear that the permafrost is too hard for digging or picking, and the mission hires Sam Tucker (left), a “powder monkey” for the local mining company. Temperatures are already in the teens, with at least a touch of snow every day. Using 10-pound hammers and gigantic chisels heated red hot by driftwood fires, volunteers John Pfeifer (left) and Tom Busch pound holes into the frozen muck and gravel. 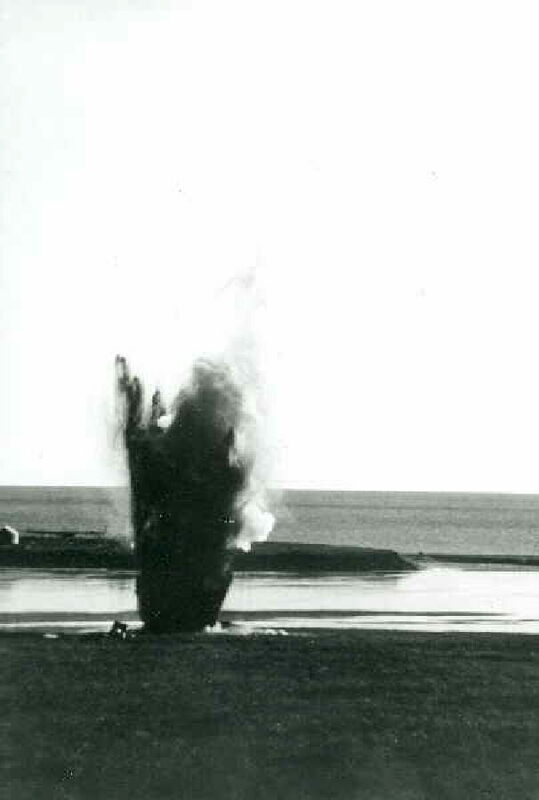 It takes about an hour to melt a hole large enough for Sam to pack two or three sticks of dynamite in, and after the blast, about another hour to bucket out debris. The main hole needs to be six feet on a side and twenty feet deep. Fighting the approaching winter, it’s backbreaking work for five weeks, every day, eleven hours a day. “Below ten feet, it became infinitely harder,” Tom remembers. (Left) “This’ll be a good one,” Sam mutters just before lighting the fuse of an “eleven-sticker,” photographed from 400 feet away. You can see the Nome River mouth and the Bering Sea in the background. Meanwhile, on September 25, 1970, the Coast Guard having relinquished the call letters, the Federal Communications Commission grants “KNOM” to the Nome Catholic radio project. THIRTY YEARS AGO: In September 1980, volunteer news director Sue Boyle’s final month, Associated Press carries 11 of her stories, matching her May 1980 record. TWENTY YEARS AGO: In September 1990, KNOM reports that Nome’s four paved streets are now painted with center lines, for the first time ever. After western Alaska’s short and cool summer, September brings dark nights, often stormy days, and the possibility of snow. As we batten down for winter, we again thank you most sincerely for your financial help and your prayers. Our mission would quickly cease to exist without both. May Our Heavenly Father smile upon you for your kindness and your caring. God bless you and those you love abundantly!